Vaga is a WordPress magazine and blog theme with beautiful and moden design. It is created mainly for the news, magazine and blog websites but due to its supern flexiblity it allows you to create the websites for any other purposes such as for travellers, writters and photographers etc. It is very easy to set up and use. It offers hunderes of possiblities to create the layout of your choice in a very easy easy. - Responsive Layout ЁC The theme has responsive layout, it adapts nicely on the screen of the device it is being viewed on and makes your website look great and work flawlessly across all of the mobile devices and tablets. - Drag and Drop Homepages ЁC The theme homepage layouts can be built with the drag and drop widgets. You can arrange the homepage sections in any order you want. - Homepage Sections ЁC There are several sections to use on the homepage, which allow you to create the unique layouts of your choice. - Image Galleries ЁC You can add the slider image galleries in the posts. There is also a built-in feature to use the standard WordPress image galleries with lightbox. - 16 Custom Widgets ЁC The theme includes several custom widgets which you can use in the sidebars and the footer. There are also custom widgets built specifically for the homepage layout. - Page Templates ЁC The theme includes several page templates. The blog template allows you to create a blog with different post layouts. There are also templates for the contact page, archives and full width pages. - Theme Options ЁC The powerful yet easy to use theme options will help you customize every detail of the layout. You can set the typoggraphy, styles and several other settings using the theme options. - Unlimited Colors ЁC If you want to change the default theme colors, you can very easily change those using the color picker in the theme options. - Unlimited Sidebars ЁC You can easily create as many sidebars as you want from the theme options and use them in different posts or pages. - Typography Options ЁC The theme includes extensive thypography options. You can use the Google fonts and change the typography according to your choice. - Code Quality ЁC The theme combines the excellence of design and the code quality. The theme code is validated and has been tested with the WordPress debugging tools. It does not generate any PHP notices or warnings. - Contact Page ЁC There is a built in secure contact form which uses honeypot captcha to prevent the spam. The contact form has both client side validation with jQuery and the server side validation. - Translation Ready ЁC The theme is translation ready. We have included the .po and .mo files, which you can translate to any language you want. - Demo Content ЁC We have included the demo content which you can import using the standard WordPress import tool to get started quickly. - Well Documented ЁC The theme is well documented and includes a detailed help file which will help you to set up the theme very easily same as the demo. - Dedicated Support ЁC Our customers are very important to us and we try to offer the best support possible. We will try our best to answer your every single question in a timely manner. High Resolution: Yes; Widget Ready: Yes; Compatible Browsers: IE9, IE10, IE11, Firefox, Safari, Opera, Chrome; Software Version: WordPress 4.8.x, WordPress 4.7.x, WordPress 4.6.1, WordPress 4.6; ThemeForest Files Included: PHP Files, CSS Files, JS Files; Columns: 3; Documentation: Well Documented; Layout: Responsive. 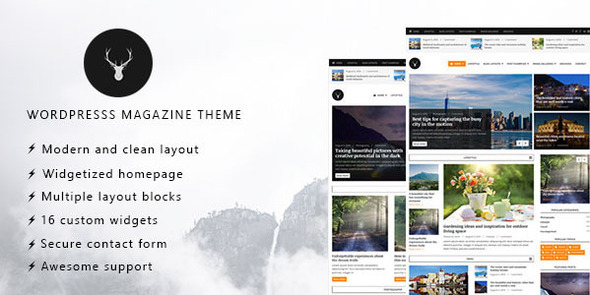 Fiji - WordPress Magazine and Blog Theme; Wolf - Responsive WordPress Magazine Theme; LeTour - WordPress Magazine and Blog Theme; Santiago - Responsive WordPress Magazine Theme; Discover - Flat WordPress Magazine Theme. Keywords: blog, blogger, clean, creative, flat, magazine, minimal, modern, news, newspaper, portal, simple, slider, travelers, widgetized. Create ThemeForest Vaga WordPress Magazine and Blog Theme 12412179 style with After Effect, Cinema 4D, 3DS Max, Apple Motion or PhotoShop. ThemeForest Vaga WordPress Magazine and Blog Theme 12412179 from creative professional designers. Full details of ThemeForest Vaga WordPress Magazine and Blog Theme 12412179 for digital design and education. ThemeForest Vaga WordPress Magazine and Blog Theme 12412179 desigen style information or anything related.